IAMS™ PERFECT PORTIONS™ Grain Free Healthy Kitten Cat Food Trays allow you to feed your kitten wet food without the mess of leftovers in your refrigerator. 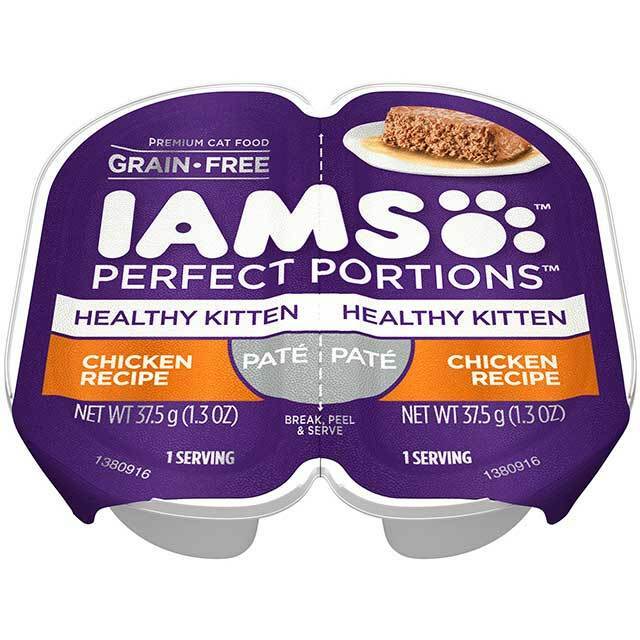 IAMS Paté Chicken Recipe is the hearty kitten food you and your pet love because it provides the best of both flavor and nutrition. Our wholesome kitten food is made with vitamin E to aid your kitten's immune system and DHA for brain development. With IAMS™ PERFECT PORTIONS™ Grain Free Wet Cat Food, your kitten gets a fresh meal every time. 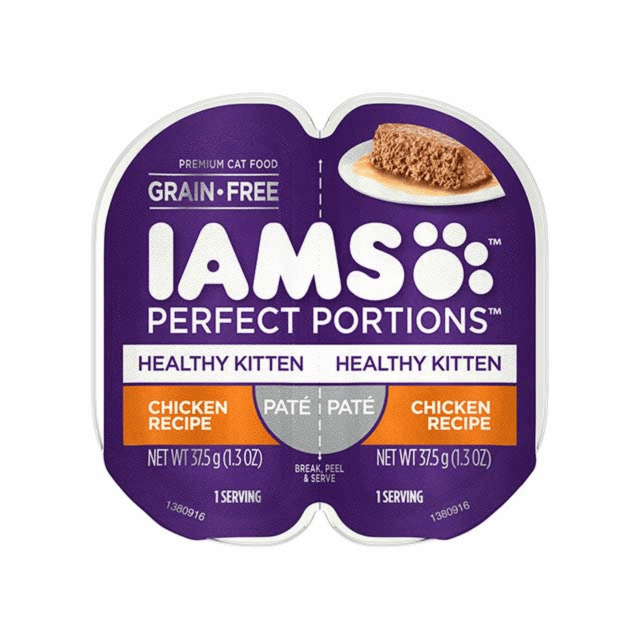 IAMS™ PERFECT PORTIONS™ Wet Cat Food provides a delicious, grain-free meal that is complete and balanced for growth with no artificial preservatives and formulated for a healthy immune system and brain development. 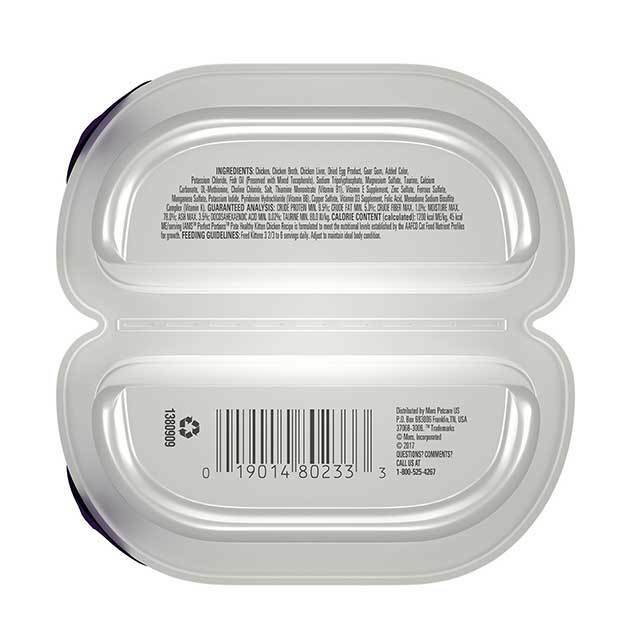 Chicken, Chicken Broth, Chicken Liver, Dried Egg Product, Guar Gum, Added Color, Potassium Chloride, Fish Oil (Preserved with Mixed Tocopherols), Sodium Tripolyphosphate, Magnesium Sulfate, Taurine, Calcium Carbonate, DL-Methionine, Choline Chloride, Salt, Thiamine Mononitrate (Vitamin B1), Vitamin E Supplement, Zinc Sulfate, Ferrous Sulfate, Manganese Sulfate, Potassium Iodide, Pyridoxine Hydrochloride (Vitamin B6), Copper Sulfate, Vitamin D3 Supplement, Folic Acid, Menadione Sodium Bisulfite Complex (Vitamin K). Feed Kittens 3 2/3 to 6 servings daily. Adjust to maintain ideal body condition.